The Hart Family is one of the most celebrated and possibly the first (there are timeline arguments to be made) first families of professional wrestling/sports entertainment. There have been quite a few books written about and by the Hart family, most notably Bret Hart’s biting, brutal, hate laced, but honest Hitman: My Real Life in the Cartoon World of Wrestling. I was a huge fan of this almost 10 year in the making tome which was more transcription of audio diary than Bret’s actual writing. Bret happens to be a great writer and has/had a regular column in the Calgary Sun. That column was once in awhile written by his older brother Bruce, the brother that without, Bret may’ve have never decided to have his father Fritz turn him into “the best there is, the best there was and the best there ever will be”. 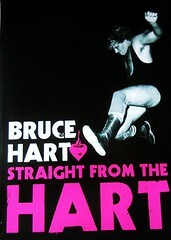 Bruce Hart, the second oldest brother, has chosen that the time was right for him to tell his very slanted side of the story in ECW Press’ Straight From The Heart. I was very gratified to get the opportunity to read and review this book from the Publicity department at ECW Press at Book Expo America. As a story/skewed memoir it is as enetertaining as any wrestling autobiogrphies of recent memory. There’s fervor, details, psychology, analysis and a great story. It’s a shame that much of Bruce’s memories or at least how he chose to put them on the page are false, incorrect, missing details or just outright lies. This doesn’t change their quality of storytelling, but if one wants to really learn about the history of Stampede wrestling or even Bruce’s own wrestling career, this isn’t the place to look. As the book continues down its path Bruce is also much more bitter than Bret ever came across in his book. Of course in respect, he has every reason to be bitter. Even through the lies and machinations, the hardships that Bruce experienced do shine and they set him apart as a person way different than his more famous family members. He seems to have a lot of vitriol for his former brother-in-laws David Smith and Dynamite Kid and he holds no punches with them, but he equally seems to have a detest for Bret. He also seems to feel he deserves credit for Bret’s success, stating he ghost wrote every single column in the Calgary Sun and that every decision and gimmick concept that Bret used to become “The Hitman” came from him. I find this a little hard to believe. As hard it is to believe that every single time Bruce had the chance to make it big, some crisis happened or someone else messed it up and his family screwed it all up for him. Even for as much respect and love he shows his father Stu and the great history, which seems more accurate than anything in the book, of Stampede’s beginnings, the latter passages show that he equally feels like his father was to blame for failure and he was the reason they had success, but since he was “in charge”, he had to take credit for everything, be it failure or success. Later on, he seems to pull back on his anger of Stu, but the feelings on Bret do not stop and sound tantamount to slander, but its such interesting and intriguing slander that it comes across as awesome fiction instead of a statement. Which as I stated much of the book comes across as, as have many other wrestling books. Unlike the very personal and open statements of Mick Foley or Chris Jericho’s books, Bruce’s book have much more in common with the books he personally quotes from, such as Ric Flair and Vince Russo. This isn’t history, it’s HIS history and he backs it up with other people’s skewed histories instead of the video truth. There’s also a ton of hypocrisy in his world view, but that also makes for fascinating and compelling reading. In the end though he thanks us the most and hopes we enjoyed the read, as much as he’s enjoyed the ride. I did indeed. I would’ve like some further clarity on the current situation of his life, where he once again got married to a woman 20 years younger than him and had a child at 56. He skipped ahead from his father’s passing in 2003 to Bret’s return to the fold of Vince McMahon’s corporation (in which Bret continues to appear in 2011 and probably beyond). Much happened in those intervening years though. I guess Bruce couldn’t think of a sufficient lie to tell to make that interesting. It may seem crazy, but I still highly recommend Straight From The Heart, just go in there with an open mind. You can choose to also take it at face value and if you’re not a real wrestling fan who actually gives a damn, do that and enjoy it, cause well, you will.